Sony Entertainment Television’s Indian Idol 10 season is buzzing all over with the first episode going on air with the Top 14 contestants. The talented singers are winning not only the hearts of the viewers but also fraternities from the film industry. The show with the abundance budding singing talent are creating buzz all around with their performances. The contestants are sheer package of talent and full of energy while performing on stage. The judges Neha Kakkar, Anu Malik and Vishal Dadlani are continuously monitoring and judging the contestants to give their best performance. One such contestant is the Orissa boy Biswajeet Mahapatra who is loved for his soulful performances. 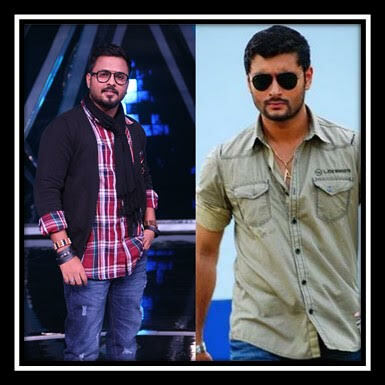 The boy has already found a fan Odia actor Anubhav Mohanty who is going all gaga over his voice. The actor has become a great fan of Biswajeet and also sent a special message on a recorded video wishing him good luck. Anubhav Mohanty encouraged Biswajeet to deliver his best performance and make it to the top. Biswajeet has also lent his voice to multiple films in the Oriya film industry and ironically has not earned much money from the same and is hoping to make it big with Indian Idol. The actor is very supportive of individuals who love to follow their passion and is even happier when dreams turn into reality. He looks forward to see Biswajeet achieve great heights in his musical career and achieve great success through a platform like Indian Idol 10. Amyra Dastur who recently wrapped up the shooting for the Bindass webseries The Trip season 2 has had quite a blast shooting with an all girls cast for the first time. The Rajma Chawal actress, along with Shweta Tripathi, Mallika Dua and Sapna Pabbi, were shooting for the second installment of the Disney series in Pondicherry and Chennai and if the girls’ Instagram accounts are to be believed, the 4 seemed to have had tonnes of fun. Amyra has always been an environmentalist and has promoted eco friendly routines and habits. While shooting in Pondicherry, the talented actress was always on the lookout for trash that had been disposed on the streets or the beaches. She would pick it up and dispose it in the dustbin. Every stray can, packet, plastic cup, anything that she found lying on the street, Amyra made sure she picked it up and threw it in the bins. This definitely awakened a rather eco friendly streak in her Trip 2 co stars, who followed suit in order to ensure that their set and the vicinity was as clean as possible. And coincidentally, Amyra picked up this habit from none other than her Kung Fu Yoga co star, Jackie Chan. “I actually picked up this habit from Jackie Chan while we were shooting for Kung Fu Yoga in Jaipur. He would quietly go and pick up the plastic bottles that people had thrown around our set. He never instructed anyone to help him or even spoke about it. People just started following his example. So I just repeated his actions in a way. I saw trash, picked it up and threw it in the bin without telling anybody to do so. My awesome girls got the idea and just followed by my example. Soon everyone on set began to do the same. I even spoke to production who agreed that no plastic straws are to be distributed on set, since we’re shooting in the South we eat on banana leaves and not paper plates, everyone has their own water bottle so no more plastic bottles get distributed on set.”, Amyra said. Amyra will also be seen in the upcoming Rajkummar Rao and Kangana Ranaut starrer Mental Hai Kya and the Sanjay Dutt produced Hindi remake of Deva Katta’s Telugu blockbuster, Prassthanam, with Ali Fazal, Sanjay Dutt, Manisha Koirala and Jackie Shroff. 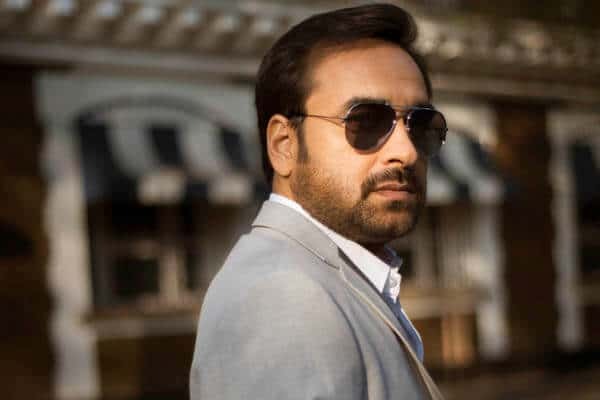 2018 has proved to be a very busy year for Newton actor Pankaj Tripathi. Right from winning a National Award for his performance in the Rajkumar Rao starrer to making his digital space debut with Excel Entertainment’s Mirzapur, Pankaj is on a roll! With 4 projects released and a few in the pipeline, Pankaj is all set to start work on his upcoming film, the Shakeela Khan biopic. Based on the 80s Malayalam film actress, Shakeela, the film will see Richa Chadha in the titular role and will depict the life of the actress spanning from her young days to becoming a nation wide phenomena as an adult actress in the late 90's. The film is being helmed by acclaimed director, Indrajit Lankesh. It was earlier reported that the actor has been roped in for the biopic while the clarity on his role wasn't out. Now the actor will be playing the role of a south film actor from the 90s and for that he has been studying his character’s essence rather minutely. While Richa has already begun shooting for the film, Pankaj will join the team end of August in a location in Karnataka for the shoot. Speaking about being a part of the film, Pankaj said, "I am delighted to be part of this biopic. It talks about a life of Shakeela that people need to hear and my character is someone who is her friend and also an Actor. It is amazing all the stories, anecdotes and incidents that have happened in her life. Glad I could be part of this film". Having been part of several popular television shows including Saat Phere, Suyra Sutra Karn, Shere Punjab Maharaja Ranjeet Singh among others, Shaleen Bhanot is set to spring a huge surprise on the audience, especially his fans with his next offering, Laal Ishq, a new show on &tv. The talented actor, also the winner of the dance reality show, Nach Baliye 4, will feature in a special one-hour episode of Laal Ishq on &tv. It’s learnt that Shaleen is quite excited to shoot for the show since it’s something that he hasn’t attempted on screen before. Interestingly, the character that Shaleen is portraying in the show and his look bears an uncanny resemblance to Diljit Dosanjh’s character from his last release, Phillauri. Besides being a talented actor, Sonu Sood is well known for his philanthropic work and his association with several charitable causes over the years. Not many know that the large-hearted actor has been tirelessly working for the serious cause of drug abuse since more than a year now in his hometown, Punjab. In fact, Sonu recently met Punjab Chief Minister Captain Amarinder Singh and appreciated the state government efforts towards eradicating drugs from the state. A source informs, "Sonu has been effortlessly working for the anti-drug campaign in Punjab with the help of several top government officials and cops. During his free time, the actor visits Punjab to assist the people working on the campaign thereby helping them to create awareness around the drug abuse. Sonu will be personally meeting drug addicts and make them realise the hazardous effects of drug consumption and advocate them to maintain a disciplined and a healthy lifestyle." Richa's look for Inside Edge 2 inspired by Jessica Alba? Richa Chadha is riding high with multiple projects in hand currently. She has been busy shooting for Inside Edge season 2 and a biopic on south adult star Shakeela Khan. She is been shuttling between both the shoot locations to project her part. Inside Edge 2 is being shot in Mumbai whereas Shakeela Khan shoot is going on in full swing in a remote village near Karnataka. Both her projects required Richa to don very different looks. The makers of the show Inside Edge 2 have given her a very edgy look to play the role of Zarina Malik, who owns a T20 cricket team. In season, 2 Richa takes the centre stage making her character bolder and more powerful than the previous season. Her look in the show is a femme fatale this time which has glimpses and has taken inspiration from Hollywood actress Jessica Alba's character Max Guevera from the popular TV show Dark Angel. The show was hit in the west back then and Jessica's uber cool look was the talk of the town. Following the suite, the makers of the Inside Edge zeroed similar look for Richa that would match her character in the series. Amazon Prime video original Inside Edge a video on demand series is based on popular 20-20 cricketing tournament that captures the underbelly of the game. It's been produced by Farhan Akhtar and Ritesh Sidhwani under Excel Media & Entertainment. The cast includes in season 2 is Vivek Oberoi, Richa Chadha, Tanuj Virwani, Angad Bedi amongst others. The show is set to premiere on Amazon Prive Video platform in mid-2019. The two pioneering young names from India excelling in the west, Ali Fazal and Freida Pinto are now coming together! The duo who will soon fly to the land down under are the key guests at the upcoming Indian Film Festival Of Melbourne 2018. These two names who have in their own way been making a unique space for themselves in the west will be delivering a talk to Australian audiences about the topic of Indian actors making it big in Hollywood! This cross cultural topic will have them expressing their views and opinions on the challenges and the need to overcome the stereotypes associated with being a non American actor working in the West. Freida who’s flying in from Los Angeles, her current home will also be attending the Australian premiere of her film, Love Sonia and Ali has been elected as the Jury member for the Short Film Awards category at the festival. Ali Fazal said, "It’s always interesting to talk to people of different countries and background. It gives you great perspective. This in fact is my first time to Australia and to get a chance to interact with film lovers and film students on a topic about crossing over is exciting and there’s so much to speak about. I remember during the promotions and post release of Victoria And Abdul, when I spoke to people such varied background, everyone had such interesting ideas of cinema and it’s role. So I’m looking forward to do this talk and discussion alongside someone talented like Freida." The panel discussion will also have director Tabrez Noorani, who’s film Love Sonia is also the opening night film of the fest. It’s all set to take place at Deakin Edge in Melbourne on 11th August where audiences from across Australia comprising of students and general audience will be in attendance..
Que- How was your experience on the show with Salman khan? Himesh- My experience was excellent. I am on the sets of Dus ka Dum for the second time. The first time when I came here, we had a lot of fun in that season too. Just being around Salman Khan who is so energetic and humorous at the same time is always entertaining. Guru also added to the amusement. With Dumdaar Salman, it always feels like you are with a family member. Que- Did you notice any difference between the last season and this season? Himesh- I think this time the season is even more entertaining, because it has an emotional connect with the audience. In terms of the questions we see are also very relatable. This is the reason when I was chatting and playing with Salman, it felt like I was talking to someone from the family. Que-How did you feel seeing Salman Khan back as a Dumdaar host? Himesh-I feel Salman Khan is not only a super star but the greatest human being. Because of the kind of charity he does, the kind of noble thoughts he has and the love and care he shows towards his close ones. I think that, this not only makes him a superstar in films, but a superstar in real life as well. He is a real hero. Que-Which Question did you find most amusing and what do you think about the janta’s anumaan? Himesh-I made a mistake while answering the last question by going along with the audience’s anumaan. I had almost decided to hit the bar of 90% to 100% and then I trusted the studio audience and locked a window of 60% to 70%. Que- What is that one question you would like to give out about yourself that will keep people guessing? Himesh-I want people to keep guessing if I am an intense human being or a jovial person. Because people have their own conclusions about me. It is fun when they keep trying to guess this. The screening of a special film Chalo Jeete Hain in Mumbai saw the who’s who of the entertainment corporate, and political world present. Chalo Jeete Hain had screening in Delhi at Rashtrapati Bhavan for Honorable President , in Parliamnet for Vice President, Speaker of Lokshabha, Cabinet Ministers etc. 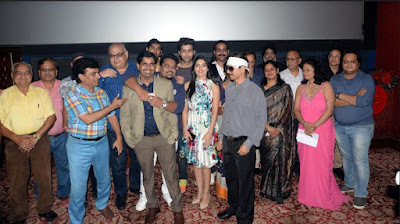 Film presenter & producer Mahaveer Jain and Mangesh Hadawale were present in all the screenings. It’s a very inspiring movie, I’m touched with the message of the film. all should watch this. BJP president Amit Shah Said - this movie will continue living on our hearts forever. Bollywood star Kangana Ranaut said "Film is well made and its just not about one individual but all of us. We as a society need to come together". Finance minister Piyush Goyal remarked, “The film is based on an incident from Prime Minister Nadrendra Modi’s life which is bound to motivate others to do good. Presenter & Producer Mahaveer Jain said - a Young Naru has become our PM now, but since last 50 years - he is still living his life for us, not for himself but for others , for our country . That’s what inspired us to make this film. Director Mangesh Hadawale said - hum kis ke liye Jeete hai , this is the question to think about our self deeply ? Film is presented by Mahaveer Jain and Aanand L Rai. Film is produced by Mahaveer Jain & Bhushan Kumar. Guru- We had a lot fun while shooting for the show. I will cherish this moment as this is the show where I got an opportunity to share the stage with Salman sir and my favorite Himesh paaji. Initially I was scared of coming to this platform because one has to be an outgoing personality on the stage and speak a lot as well. But Salman sir made me feel comfortable throughout the shoot. Overall, I had a great experience working with him and being a part of Dus Ka Dum. The money that we earned while playing Dus Ka Dum will certainly go to charity and what can be a nobler cause than that. Que- Do you support charity? Guru- Yes, I do support charity. In our life, we should always help people who need support. Even if we cannot help anyone financially, we should extend a helping hand in some or the other way. Guru- Which spray do I use to style my hair? Laughs! Keep guessing. Que- How does it feel launching your song on such a platform? Guru- For the very first time in my life, I have released my song on such a huge platform and it wouldn’t have been possible without the support of Salman Khan, Dus ka Dum team and Sony Entertainment Television. I thank each one of them and Himesh paaji as well. Therefore, the VP of India, Shri M. Venkaiah Nadu addressed the gathering after watching the short film “Chalo Jeete Hain” based on the childhood incidents of the Prime Minister, Shri Narendra Modi. 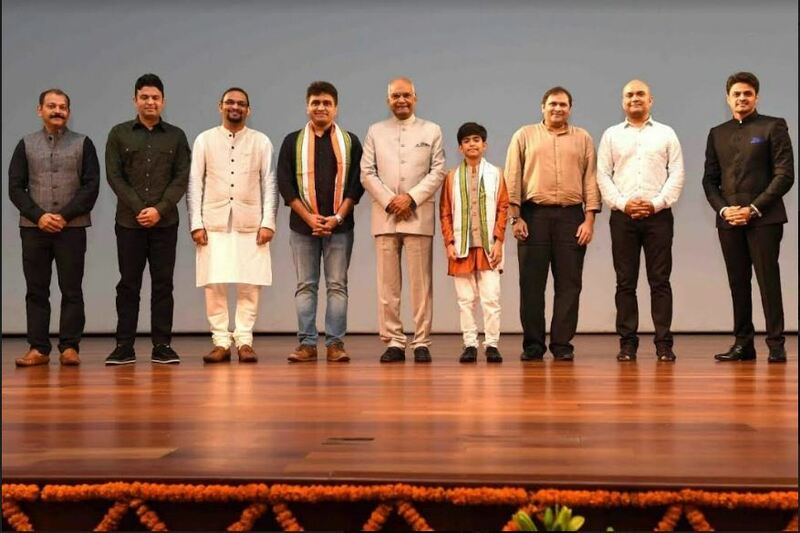 The Vice President appreciated the entire team of the film, Shri Mangesh Hadawale, Producers Shri Mahaveer Jain and Shri Bhushan Kumar for making a film that captures one of the key messages of Indian Culture. Country Club is known to build everlasting family clubbing, holiday, fitness and leisure entertainment industry benchmarks. At the Launch of new The Millionaire Membership with the beautiful actress Evelyn Sharma along with CMD Country Club Mr. Y Rajeev Reddy. It’s a historic milestone for the Country Club. With this new launch we look forward to extend our reach & help grow the country club family. 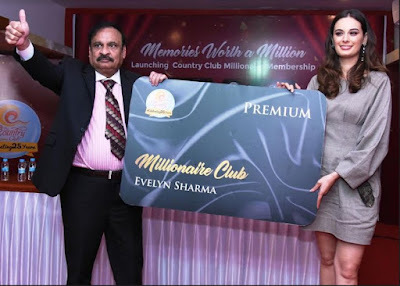 Speaking on the occasion of the launch of The Millionaire Membership, Country Club CMD Mr. Y. Rajeev Reddy says “The Millionaire Membership comes as a boon to many people who want to spend quality time with their families and enjoy all the varied facilities offered by the Country club”. Mr Reddy also said that starting from one club in Hyderabad with 400 members in 1989 to 4 Lacks Members today, Country Club today is spread over 50 locations spanning across India, Asia and the Middle East, putting Country Club in the global map. Country Club Hospitality and Holidays is India’s largest leisure infrastructure conglomerate that offers state-of-the-art clubbing facilities, innovative family holiday packages and star-studded entertainment events. Recognized by the Limca Book of Records as ‘India’s Biggest Chain of Family Clubs’, Country Club has 53 world-class destinations across India, Middle East, Bangkok and Sri Lanka. Also, Country Club offers global clubbing and holidays. Known as the ‘Power House of Entertainment’, Country Club regularly organizes various innovative entertainment events and celebrates diverse national and international festivals across every destination. During such festivals, celebrities from Indian movie industries are invited to perform for the ‘Country Club Hospitality and Holidays 'members and their family and friends.